Good News Club, Inc. of Northumberland County owns and operates a bookstore. 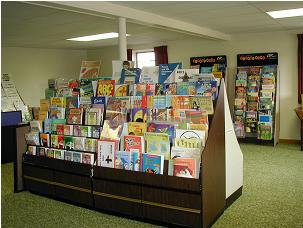 The bookstore is designed to help our Good News Club teachers and other children’s workers. We carry visualized songs, flashcard and flannelgraph Bible lessons and missionary stories, Bibles, children’s books, boxed cards, flannelboards, easels, and small prizes. Come and visit us anytime! For the last several years we have been building our lending library. The library consists of 20 sets of our five-year Good News Club teaching cycle. The sets include everything that the Good News Club teacher needs for each club. The library has proven to be a wonderful tool to help our Good News Club teachers.